chill . . . ARE YOU in the mood to transition your space into something that's Autumn fresh? Yes? Then please enjoy our latest look book combining thoughtful fabrics, colors and designs in unison with time. MATOUK, SFERRA, SCHLOSSBERG, YVES DELORME, and our many other fine bed linen designers have exceeded our expectations once again. Did you know, for 35 years and counting, DEWOOLFSON has been meticulously filling and stitching down fillers to create the finest down pillows, comforters and featherbeds? They create the items that truly elevate a bed and a night's sleep from being nice to becoming execptional. Click on any item within this look book to be taken to a coordinating page on our merchant website - dewoolfsonlinens.com - where you can discover other fine bed, bath and table linens and home decor. 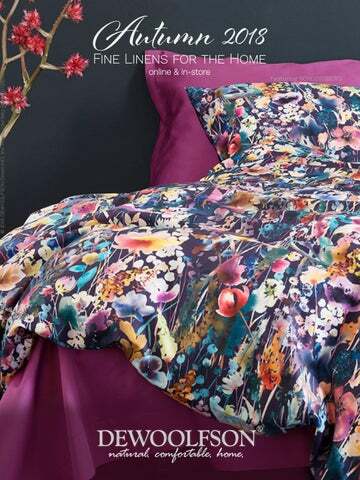 Nocturne Egyptian cotton sateen fabric. Herringbone quilting pattern. Numerous colors. U.S.A. made. Italian woven. DOWN COMFORTERS DEWOOLFSON white goose down comforters. Made with internal baffled-box construction. Available in 5 weights and in 6 unique down-proof fabrics. "It 's a beautiful comforter and so very cozy and warm"
call us in the morning. Our pillow protectors are densely woven in Germany from the finest yarns and techniques. comforting BODY PILLOWS Our full length body pillows provide complete torso support while you sleep. Enjoy sitting-up in bed? This pillow makes a great bolster to rest against the headboard. You're going to appreciate this pillow! Rest assured that you'll both sleep comfortably under a comforter that's zoned to your desired warmth level. I ' 'm too hot ' or I ' am freezing'. provide a level of sleep comfort that's unsurpased. Several times thicker than most. Baffled-box construction. Three down/feather blend fills Proven downproof fabric. "...L,aying on it has to be experienced to be believed â&#x20AC;? So sweet. " -Richard J. Get cozy with the latest fine bed and bath linens from France, Italy, Switzerland, Portugal and around the world.